Being a mum to a teen is tricky, it really is and being mam to a 14-year-old teenage daughter myself I know first hand what it is actually like. Every day is a learning curve. Boots and P&G understand this too which is why they are back for the second year with their #TeenTalk campaign along with trusted brands such as Tampax, Venus and Always. This year they have teamed up with TV presenter Gabby Logan and her 12-year-old daughter Lois to help give parents the confidence to have the dreaded #TeenTalk with their own children. 33% of parents wish they could talk more openly with their teen. 68% of parents find it difficult to approach puberty topics with their teen, so much so that a quarter avoid it. This shows that parents can often feel confused and unsure how to broach the subject of puberty with their children (myself included). 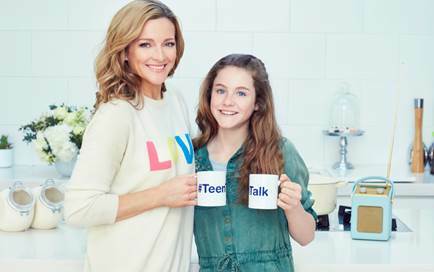 To help parents feel less alone when it comes to having the talk, campaign ambassador Gabby Logan and her daughter Lois joined a panel of real parents and daughters to take part in the #TeenTalk experiment. This involved parents and their teens having the #TeenTalk every few days for a week, trying out different ways of approaching the subject for each conversation. Their experience can be found on the Boots website. #TeenTalk ambassador and mum of twins Gabby says "As a mother of twin 12-year-olds, I understand the challenges of communicating with tweens all to well. They suddenly go from wanting to tell parents everything, to one word answers. But as every parent knows, you desperately want to give your children all the guidance, help and support they need and being able to communicate effectively with your teens is crucial to this. What I love about the #TeenTalk campaign is that it helps to give parents the confidence to start and maintain a strong, open and honest conversation with their child through puberty and beyond." As a parent to a teen myself, I can totally relate to what Gabby says, the one-word answers and not wanting to tell me everything is something I know all too well. As part of the campaign Sarah Newton an expert with 14-years experience working with teens has provided tips and advice for teens in the new #TeenTalk guide, which is available free from Boots with the purchase of any Venus, Always or Tampax products until the 6th June 2017. Boots will also be running some great promotions on these trusted P&G products between 10 May and 6th June. Such as if you spend £8 or more on Aussie, Venus, Always or Tampax products instore or online you will receive a free toiletry bag. So if you have a teen or a tween head on down to boots to stock up on teen toiletries and get your hands on your free copy of #TeenTalk before the 6th of June. I know I will be getting my own teenager a copy as I think the more information we provide them with the better, as lets face it being a teen can be a pretty confusing time for them and it is our job as parents to guide them through it. Research was conducted via onepoll amongst 1000 UK teenagers aged 13-18 and their parents in February 2016. Very good campaign this and something that I feel has been sadly missing from teenager life! Oh what a fabulous campaign and so worthwhile, i will head over to boots to check it out! Such an important campaign! Our daughter is only two, but already I understand the importance of being open throughout those teenage years! I have been reading a lot about this campaign and now nice of Boots and P&G to do this campaign second year running. When I was a teenager it was hard at first to tell my mum about puberty but somehow we managed it and it was great afterwards. I'm dreading my girls becoming teenagers. They are 6 and 8 and like mini kevin the teenagers already lol. This sounds like a good campaign, raising some good awareness. Off to check out more info. Really good campaign. Apart from puberty, there are so many things that you should talk about, like cyber safety. Sounds like a great campaign. My mother gave me a book to read rather than talk about all these things and it was SO awkward! I'd have much rathered a conversation.